I'm a teenage writer and I want to share what I know about the world around me with other people. I particularly have a passion about politics, tech, and science that I want to share with others. I hope to inform people of these subjects in the best way possible. Planetary Resources Inc.(PRI), an asteroid mining company backed by tech heavyweights such as Sergey Brin and James Cameron and headed up by Peter Diamandis, recently launched a Kickstarter campaign to develop and launch a publicly accessible space telescope. This new technology, named the ARKYD-100 (after droid maker Arakyd Industries, for you Star Wars geeks out there), will have the potential to put the power of a mini-Hubble and other space telescopes in classrooms, museums, and homes around the world. It is truly the ultimate science fair project! For a certain pledge amount, any individual or group will be able to use the telescope to explore the Solar System and the rest of the universe from their computers. Imagine a day when you can use an app on your computer or tablet to discover a new superstorm on Jupiter or a new star system. 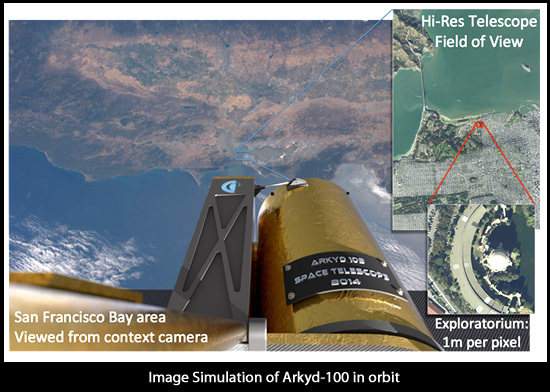 In keeping with the philosophy of the Maker movement, the Arkyd is a dynamic new tool that allows citizen scientists everywhere to conduct and develop experiments and projects previously only accessible to NASA scientists. What’s more, you can also take a “space selfie” on an onboard screen on the Arkyd, and a robotic arm will take a picture of your picture with the Earth in the background. It’s much more worthwhile picture than a duckface! This Arkyd-100 will actually be one of many in a fleet of Arkyd spacecraft that Planetary Resources will use to find potential asteroids to mine, but the Arkyd-100 will not directly make profit for Planetary Resources. So rest assured you’re not pledging your money away to a soulless corporation. And as icing on the cake, Planetary Resources is announcing stretch goals that, if met, will fund an enhancement onto the telescope that will allow it to locate exoplanets, or planetary bodies outside our own Solar System. They’re also hosting a competition for schools where students can post short videos explaining why they want their schools to have access to Arkyd, and the winner receives free time on the telescope. If you’ve ever marveled at the stars and felt an uncontrollable yearning to get out there and discover new ones, Arkyd is for you. If you are a student and want your science teacher to have a space telescope in your classroom, Arkyd is for you. And most importantly, if you’re a Maker and an amateur astronomer of any age who passionately loves the cosmos, Arkyd is the perfect tool for you! Also, make sure to look at the Planetary Resources YouTube channel for more information about the company.